The pine snake or pinesnake (Pituophis melanoleucus) is a fairly large non-venomous and harmless colubrid species found mainly in the southeastern part of the U.S., although their range is not continuous. ​Pine snakes are found throughout Florida and the Coastal Plain of North Carolina, South Carolina, and Georgia. 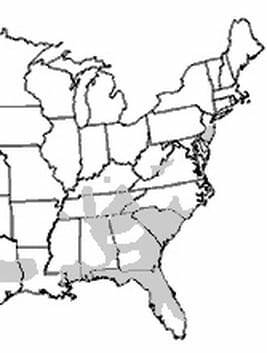 Other separate populations inhabit Tennessee, Virginia and northern Georgia, and there is also an isolated population in the Pine Barrens of southern New Jersey. The pine snake habitats include pine and oak forests, fields, scrublands, and hill and sandy pine barrens and mountain ridges at altitudes of up to 9000 ft (2700 m). The sandy soils are an important habitat for pine snakes because these snakes are excellent burrowers, digging both summer dens or hibernacula. This type of snakes also uses abandoned animal burrows. They spend most of their time underground, they can be observed at the surface in the spring through the fall, particularly from May to October. The pine snake is an excellent climber and sometimes climbs on the trees to raid bird's nests. The pine snake is a rather large and fairly heavy-bodied snake, averaging 48 to 66 inches (122-168 cm) in length but can reach 8,3 ft (254 cm). They weigh between 4 to 8 pounds (1,8 to 3,6 Kg). The pine snake base color may be white, yellow, or light gray, covered on the sides and back by darker blotches of black, brown or reddish. These blotches are usually a darker shade near the head and become lighter toward the tail. Their belly is white with darker spots on the sides. The species and its subspecies are also known by many other common names like North American pine snake, common pine snake, black and white snake, carpet snake, chicken snake, eastern pine snake, northern pine snake, horned snake, New Jersey pine snake, pilot snake, white gopher snake. The pine snake belongs to the genus Pituophis, which also includes bull snake and the gopher snake, these species are among the largest North American colubrids. When feeling threatened or if disturbed, they will often hiss loudly, sometimes it flattens its head, vibrating its tail and eventually it strikes. There are 3 subspecies currently recognized for the pine snake. Black pine snake (P. m. lodingi) - Found from southwestern Alabama into eastern Louisiana. It was described by Blanchard in 1924. This subspecies subspecific name, lodingi, was given in honor of Danish amateur herpetologist Peder Henry Löding who lived in Alabama. Northern pine snake (P. m. melanoleucus) - Found from southern regions of North Carolina and New Jersey, west through South Carolina into northern Georgia, also in southeastern Kentucky, eastern Tennessee and south into Alabama. Described in 1803 by Daudin. Florida pine snake (P. m. mugitus) - Found in Southern parts of South Carolina into Georgia and southern Florida. The subspecies was first described by Barbour in 1921. Like all snakes the pine snake is a carnivore, meaning they are meat-eaters. They will hunt, kill and eat a variety of prey including small mammals, pocket gophers, mice, rats, moles, birds and bird's eggs, lizards, and amphibians. The younger snakes prey upon smaller mammals, lizards and even insects. Pine snakes will often enter animal burrows in search of the next meal. Using an unusual technique to kill its prey, by pressing the animal against the burrow walls using its strong body. Sometimes they even score multiple kills using this strategy. The pine snake mating season takes place during the spring. The pine snake is oviparous, females will lay 3 to 24 eggs from June to August, in sandy burrows under logs or large rocks. The species is known to build communal nests, where several females lay eggs in the same burrow. The eggs are among the largest of any snake in the USA at 2⅝ in long by 1¾ wide (66 mm by 45 mm). They hatch after a 64 to 79 day incubation period. Females will often return to the same nest to lay their eggs year after year. The hatchlings measure 13 to 18 inches (33–46 cm) in length and need to fend for themselves right from birth. The pine snakes reach sexual maturity at the age of 2 to 3 years. Due to the pine snake wide distribution and presumed large population, the species was classified as Least Concern (LC) on the IUCN Red List of Threatened Species.The population numbers of the pine snake are probably still large but the population is trending down. The pine snake has no federal protection in the US, but some states have the species listed as threatened and have passed laws protecting them. 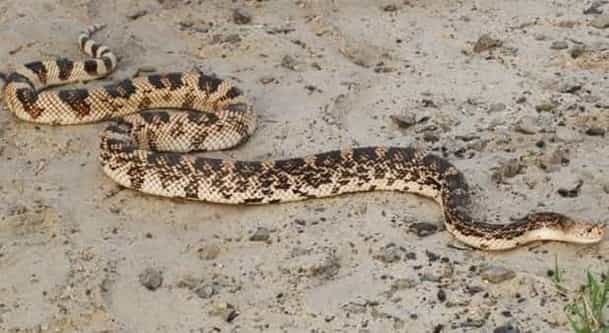 In Georgia, for instance pine snake is listed as threatened and considered rare to uncommon, and are protected throughout the state. Pine snake population has been decreasing rapidly especially in the northeastern part of its range. They're believed to have been extirpated from Maryland and West Virginia and is also highly at risk of being extirpated from New Jersey. The major threats to their survival are like many other snake species habitat destruction or degradation but also the illegal collection for the pet trade and also forest fires. Beside the longest fangs the highly venomous gaboon viper as also the largest venom glands.